Store and protect your Blu-ray discs with this 30-pack of Verbatim Blu-Ray DVD Cases. Each case includes clear wrap for holding a movie insert sleeve, and a locking clasp keeps the case closed. Inside, an easy release hub makes it simple to insert and remove discs. 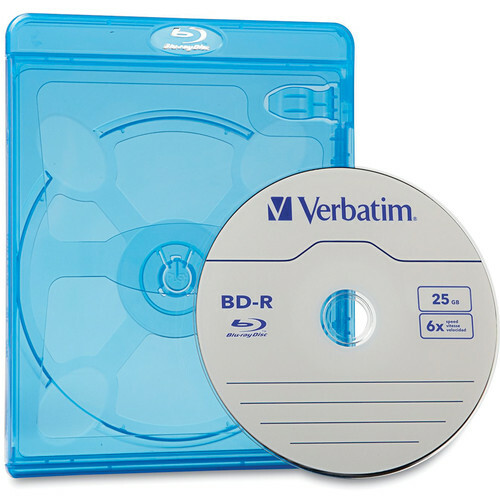 Box Dimensions (LxWxH) 13.4 x 7.5 x 5.9"
Blu-ray DVD Cases (30-Pack) is rated 4.7 out of 5 by 9. Rated 5 out of 5 by Che Sun from Very nice quality cases. I just purchased a portable Blu-Ray burner to burn disks from my camcorder. I was a little hesitant to buy 30 of these, thinking to myself that I’ll never use all 30 of them. But the quality of these cases are very good and they snap close perfectly. Again, who knows if I’ll use all of them,but if you want high quality case...go for it.. Rated 5 out of 5 by Michael from Look very professional I used to use another blu ray case sold on B&H until it was discontinued and then found these. These cases are far superior to the previous brand (whose name escapes me) and have a much better build quality. I used them to package the final cuts of a short film and the executive producer was very impressed with the final product. Rated 5 out of 5 by preacher1 from Very sturdy item which protects the DVD well I use this product with my DVD-R video projects and to protect my CD music. Even though the cases say Blu-ray on the I use them with CD's and DVD-R because I've been unsuccessful trying to find as sturdy of a case for my DVD's and CD's. Rated 5 out of 5 by William from Great Price and Good Quality Purchased for replacement cases. The quality on these is even better than some of the original Blu-ray cases that come with films. They are solid. They were all packed and shipped quite well and arrived in excellent condition. Rated 2 out of 5 by Johnny from I might buy them IF I can not find the other product. It is okay to use. but not as good as the other product that I have. That product labelled as: Blu-ray 3D. It is better build than this one. This one looks so cheap and not sturdy. Rated 5 out of 5 by krodd6 from GREAT QUALITY!!! I am a wedding videographer and these cases are great high end quality. Makes your end product look very professional!